Electric Household Appliances Market size was around USD 350 billion in 2016, with shipments of over 600 million units. 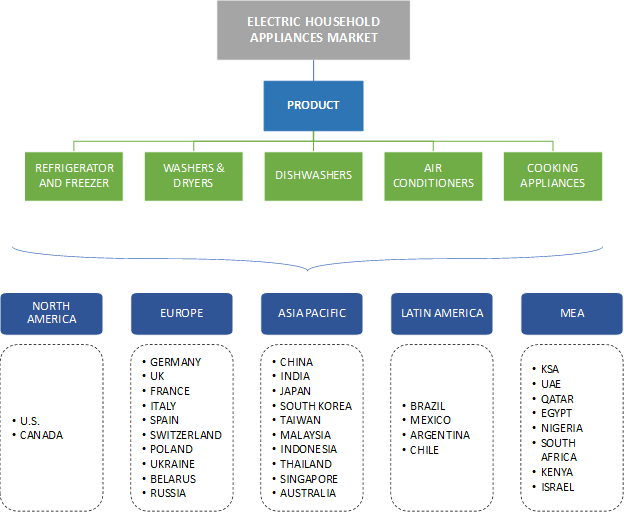 Electric household appliances market is expected to witness a significant growth over the forecast timeline due to the rising disposable income of individuals in Asia Pacific. The increasing demand for air conditioners, refrigerators, and washing machines, can be attributed to the improving living standards and increasing number of households across the globe. Major appliances, such as washing machines, refrigerators, and air conditioners, have continued to sustain robust demand in APAC due to the high consumer demand. As regional economies are advancing, consumers have started utilizing modernized devices and adopting technologies to improve the household. The low-level adoption is translating to an untapped potential for electric household appliances market players. Steady growth is predicted in the developing markets while rural regions are set to outdo the trends due to the improving lifestyles and rising purchasing power. The active participation from government organizations will provide significant opportunities for the industry participants. The economic downturn and poor export performances are anticipated to inhibit the market growth over the forecast timeline. Several countries are facing socioeconomic and economic challenges with structural challenges hindering the economic growth. Instability of exchange rates, inflationary pressures, and poor export performance are further straining major households with growing financial burdens. The global air conditioners market demand is anticipated to rise due to rising temperatures and increasing income levels of the middle-class population. The construction activities followed by the improving living standards of the people will provide opportunities for the air conditioner industry growth over the next seven years. The surge in the adoption of air conditioners can further be attributed to the reduced prices of such products, contributing to the electric household appliances market growth. The cooking appliances consist of small products, such as coffeemakers, food processors, blenders, which are generally designed for countertops. These are less expensive and are used for specialty purposes. They are gaining popularity owing to the increasing disposable incomes and lifestyle changes of consumers, reducing the price gap amongst the products offered by various companies and thereby propelling the global electric household appliances industry size. 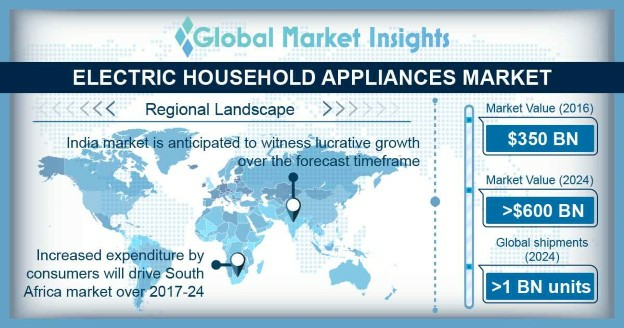 Electric household appliances market in India is expected to witness a signficant demand over the future owing to the increasing disposable incomes and a significant rise in the demand in rural areas. In addition, government initiatives and the presence of a number of companies in India have also fueled the industry growth. Government initiatives, such as Make in India campaigns, have caused many manufacturers to boost their local production capacity and set up new production facilities in the country. Furthermore, the increase in working women population has contributed to the rise in the demand for electric cooking appliances and automatic washing machines. The trend of increased spending of consumers is expected to drive the South Africa market growth. South Africa is leading its regional counterparts in terms of cropping up of manufacturing centers. Vicinity to Indian and Atlantic oceans, large population, and cheap labor are attracting several manufacturers from Europe and Asia Pacific. This is expected to reduce the cost of products, thus propelling the demand further. After catering to Asia Pacific markets, the technology product firms are now shifting their bases to Africa. Additionally, declining poverty levels are further driving the market in the region. Industry players include LG, Samsung, Electrolux, Whirlpool Corporation, Siemens AG, Walton Group, etc. Due to the increasing demand for energy-efficient products, these industry participants are actively developing devices with more features such as temperature detection. R&D activities are also quite prevalent throughout the electric household appliances market. Various programs, such as the home energy action program, are being undertaken by the government bodies to deliver energy-efficient devices to low-income households. With countries directed toward minimizing the carbon emissions levels, several programs and policies are boosting innovations in product development efforts. The ecosystem is characterized by various government initiatives for using energy-efficient products. For instance, the Ohio Government has undertaken Electric Partnership Program (EPP), which is aimed at improving the electric efficiency of low-income households. Many regulations also characterize the industry, such as the electric equipment safety regulations and minimum energy performance standards, which look after the energy requirements of various appliances. Manufacturers are heavily investing in building products that can be managed through smartphones.